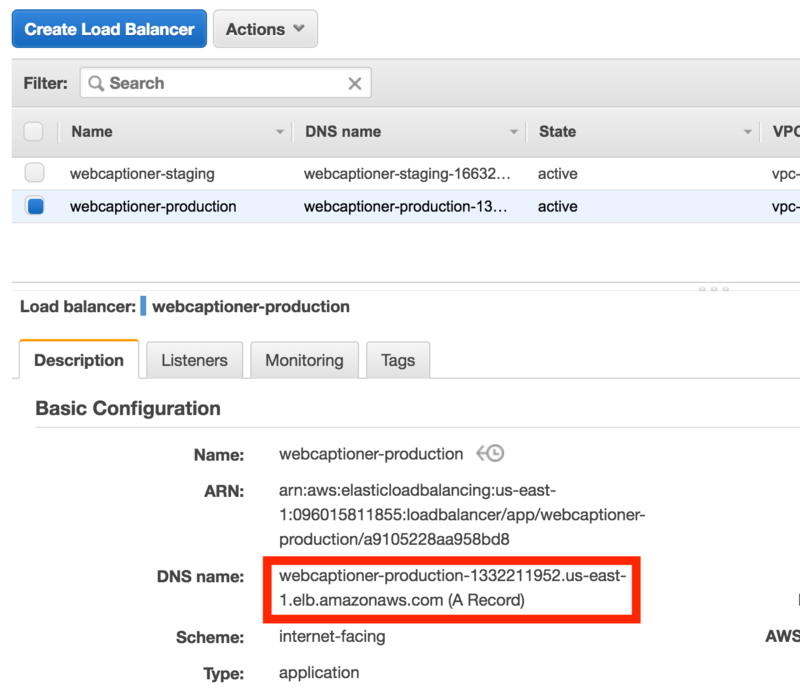 Web Captioner now runs on AWS Elastic Container Service (ECS) and Fargate, services by Amazon that allow you to deploy a Dockerized application without having to configure servers. 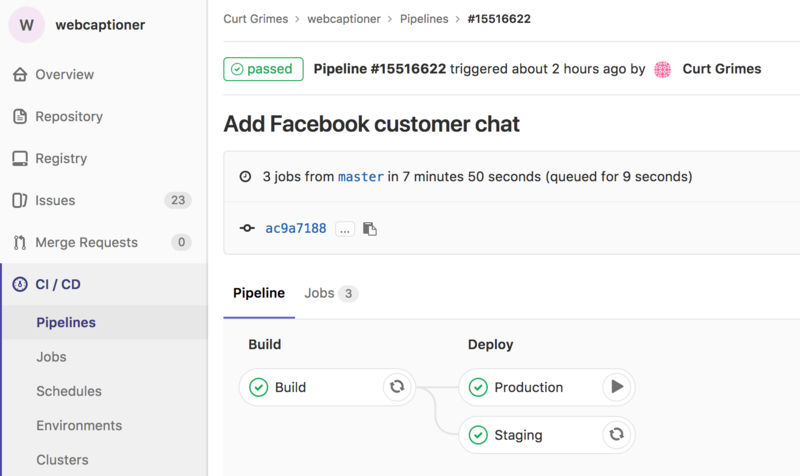 This post explains how I deploy the Web Captioner application to a AWS Fargate task type using GitLab. With GitLab and AWS, I can make one-click deployments to my staging and production environments. I can independently deploy different branches of code to each environment. With minimal effort, it’s also possible for me to create an additional stack (load balancer and all), and deploy to that. AWS also provides alerts if my application ever becomes unavailable (or the number of concurrent instances of my application falls below a threshold) and some cool graphs. Graphs are always cool. I decided to use AWS ECS and Fargate for Web Captioner because of the redundancy and high availability it provides. It also abstracts away just enough of the work of server management so that I can spend more time on application development. The AWS stack includes the following resources that you will need to set up. A service that belongs to the cluster that runs Fargate type tasks. A task definition that references a Docker image stored in your registry and defines CPU and memory requirements for that image. The service uses this task definition to start one to many running instances, called tasks. An application load balancer that redirects requests to healthy targets in a target group. My load balancer is listening on ports 80 and 443 and redirecting all traffic on those ports to one target group where one to many Web Captioner application tasks are running. A target group. My application is simple, so I only have one target group answering all types of requests. AWS Fargate abstracts away much of the work of dealing with a target group. Behind the scenes, Fargate tasks are running on EC2 instances that are members of this target group. A good way for getting all this set up is by following Amazon’s cluster creation wizard in the AWS console. It’ll create these resources and link them all together, but there’s certain things you won’t be able to change after they’re created, like the naming of some resources. To get around that, you can use CloudFormation to create an entire stack. It’s difficult to recreate a stack you’ve made with the wizard (for example, if you want to have staging and production environments), so I use this Web Captioner CloudFormation stack template (JSON) template for easily creating an entire new instance of my stack. 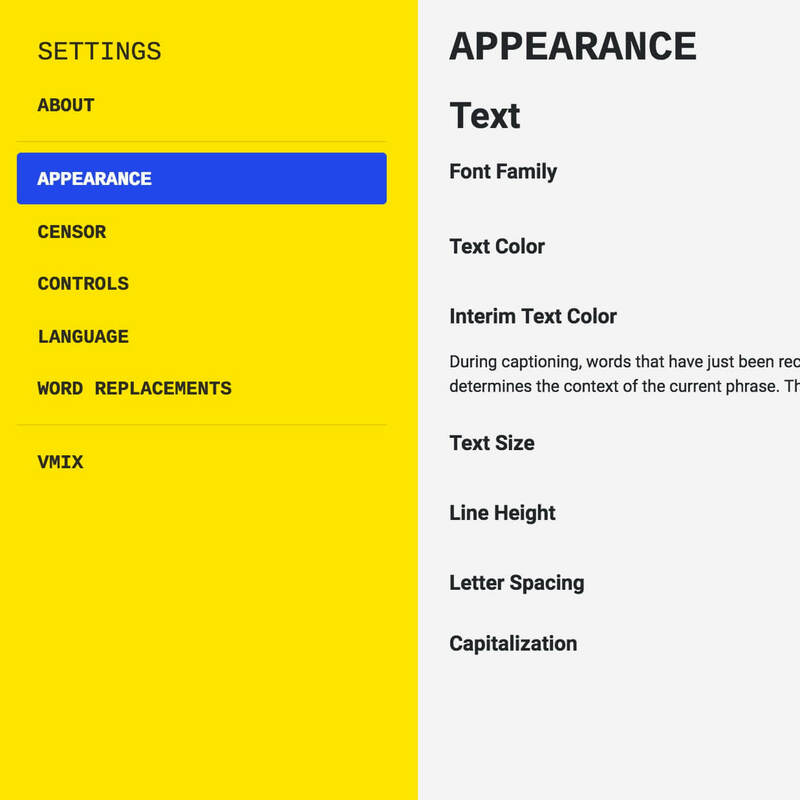 Note that there are references to Web Captioner in here (search for “webcaptioner”) that you will need to change. When you create this stack, it also asks for the name of an existing task definition (so you will need to have a task definition already created). You’ll need to set 80 and 443 (or some other ports) as listening ports in your load balancer after the stack is created, or maybe add a certificate from AWS Certificate Manager if you’re going to use a domain name. If you use this template, treat it as a starting point and customize it to fit your needs. You could also try creating your own CloudFormation stack based on the stack created by the cluster creation wizard, but you’ll have to do some tweaking to get it working in a repeatable way. 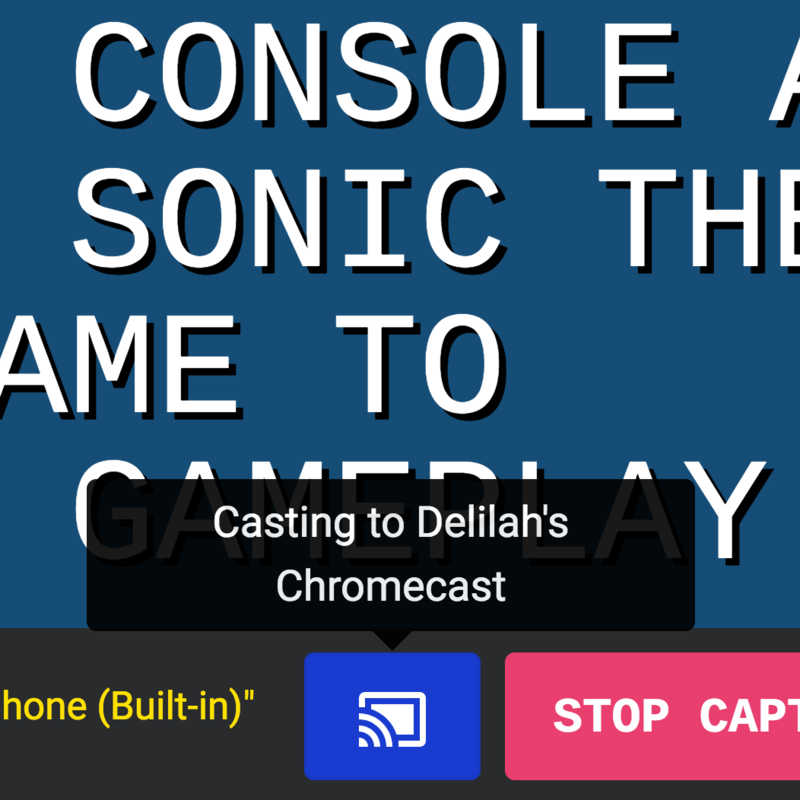 The CloudFormation template above is the result of my tweaking to get something that works well for Web Captioner. My application is a Node.js application in a Docker container that exposes itself on port 8080. AWS’s application load balancer takes care of routing traffic from ports 80 and 443 to the container’s port 8080. Before you continue, you’ll want to make sure your application runs in a container and exposes itself on a single port. To keep things straight when configuring the load balancer I’m exposing a port that isn’t 80 or 443. - docker build --pull -t $CI_REGISTRY_IMAGE:$CI_COMMIT_REF_NAME . 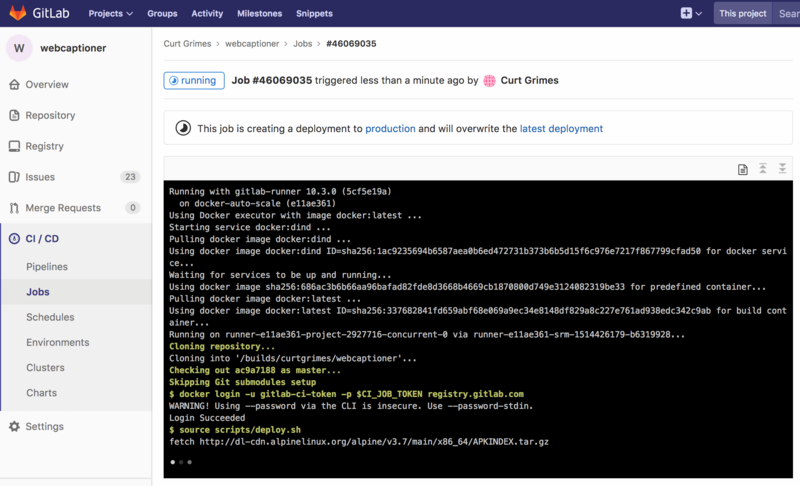 These lines let us use the docker-in-docker executor on Gitlab.com, which gives us access to docker and docker-compose in our CI scripts. We are logging into GitLab’s container registry. During the build stage, after we build our Docker image, we will push it to this registry. Later during deployment the image gets pushed to the AWS elastic container service (ECS) registry. Our build stage will happen every time we push a new commit. $CI_REGISTRY_IMAGE and $CI_COMMIT_REF_NAME are special GitLab CI variables that get replaced respectively with the path to the GitLab registry tied to the current project and the current commit’s branch name. 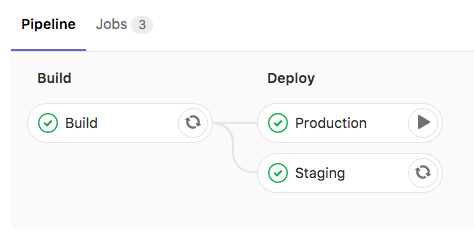 These next two sections define two deploy stage jobs - one for deploying to a staging environment, and one for deploying to my production environment. They run a deploy.sh script that I’ll get to in a minute. On the Production job, when: manual prevents this job from running automatically — but I can start it on any commit if I wish. GitLab has more information about the when keyword in CI configurations. Learn more about getting your AWS access key and AWS secret access key that will let you use the AWS command line interface. I’d suggest installing the command line interface and playing around with it to make sure you can get it connected to your AWS environment outside of GitLab CI scripts. For convenience, I’ve also put AWS_REGION in here as a variable. (As of this writing, Fargate is only available in US East, N. Virginia). # made available with the AWS access key and AWS secret access keys above. # The command returns an extra newline character at the end that needs to be stripped out. # Push the updated Docker container to the AWS registry. # name defined for this job in gitlab-ci.yml. # to my repository in a aws/ directory. # Tell our service to use the latest version of task definition. 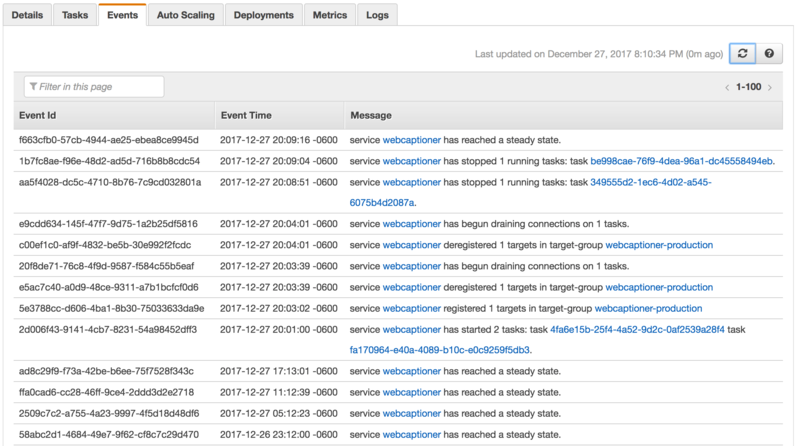 So when we run aws ecs update-service --cluster webcaptioner-$CI_ENVIRONMENT_SLUG in deploy.sh above, we’re updating the service of the cluster named webcaptioner-staging or webcaptioner-production. deploy.sh above uses a task definition JSON file stored in our code repository to register a new version of a task definition every time our container updates. Even though the definition doesn’t have to have changes, we still need to register a new version so that we tell our service (which can run one to many concurrent tasks made using the task definition) that a new version of the task definition exists. 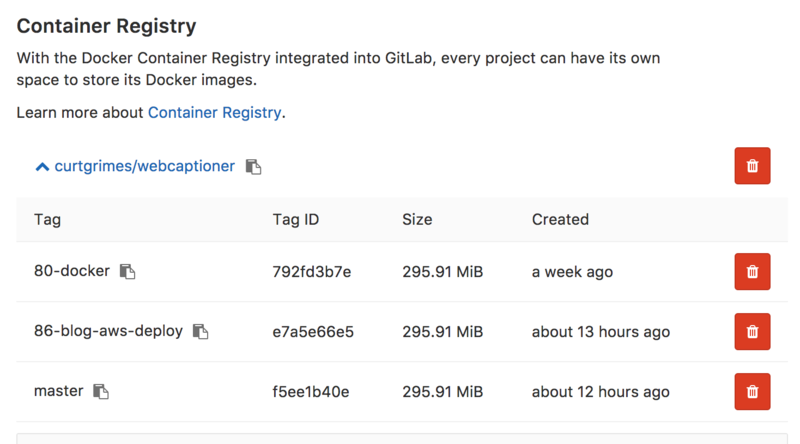 Some things to note here: The image value has the path to my AWS container registry and says to use the image tagged production (which happened when I pushed the image in line 24 of deploy.sh). The environment array lets you define environment variables for your Docker container. 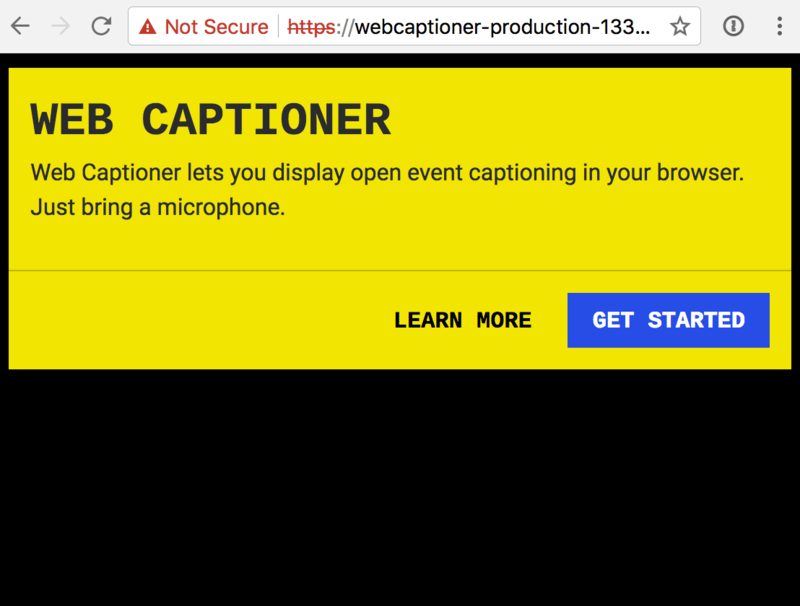 In my case, I’m setting a configuration value for Hugo, the static site generator I use to create this blog and Web Captioner’s Help Center. Also note that 8080 is the port that my container exposes itself on. 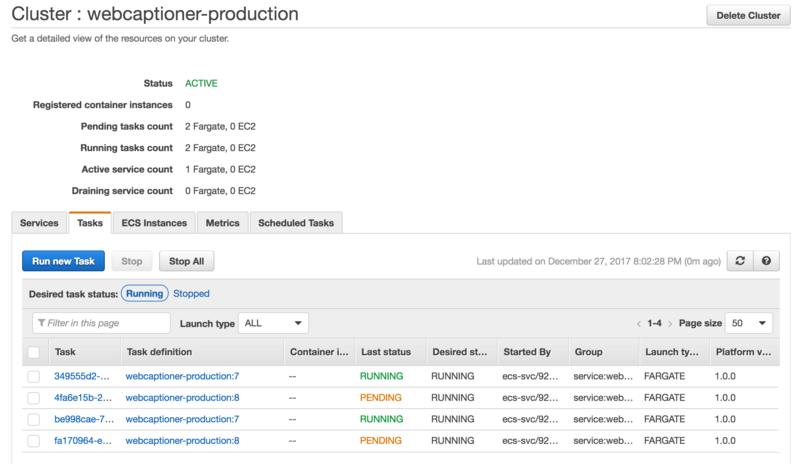 After the deploy is done, the cluster running in AWS will replace its running instances of tasks with the new version. It will take a few minutes for it to switch over and for autoscaling to automatically stop the old instances (depending on how you have autoscaling configured in your cluster). I have my cluster set up to always have a minimum of two task instances running, and you can see here that the old version (7) of the task runs while the new version (8) is starting up. Got questions about how I’m deploying from GitLab to AWS? Feel free to comment below or message me. For questions about Web Captioner, the Help Center answers some commonly asked questions and the Web Captioner Users Group on Facebook is a great place to get help from the Web Captioner community. Like Web Captioner on Facebook to be notified of new updates and upcoming features. 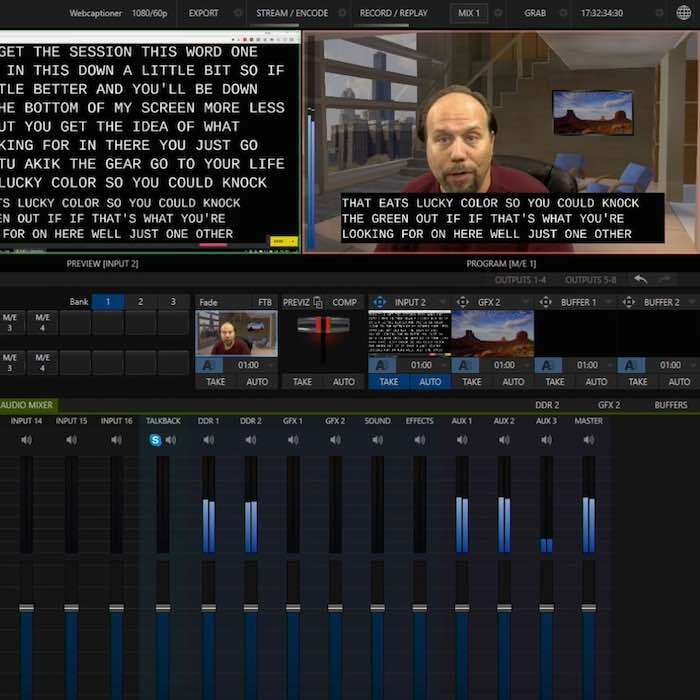 If you’ve got an idea for something you’d like to see Web Captioner do, let’s hear about it!